Vampires used to be scary. You could confidently walk into the latest vampire movie and fully expect to shriek with terror at the mere sight of the vampire. These days, vampires are eerily attractive. We don’t know exactly when it happened, but vampires in the movies these days look like a person you might meet at an alt music concert. They have perfectly swept hair, a brooding look in their eyes, and slightly pale skin. We want the freaky vampires back! We want the kind of vampires who look like ravenous fiends from a horror film. We want the ultra-pale skin with eerie black shading around their eyes. We want blood trickling down their chin. We want to make vampires scary again! 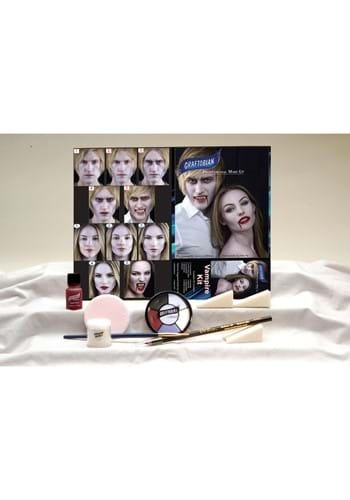 This deluxe vampire makeup kit should help you create the kind of bone-chilling vampire style you’ve always dreamed of. It comes with everything you need to complete a ghastly makeup look, including a crème foundation, 4 crème color contour shades, an eye lining pencil, a makeup brush, blood gel and face powder. It also comes with a powder puff and sponges to help with application. Full color instructions help you make the most of the kit.